Here at Design Science, we strive to promote the highest level of safety when it comes to medical practices, which includes preparing for possible medical emergencies in-house. 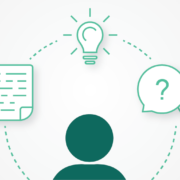 Our staff works with users with varying illnesses and unique physical abilities every day. To ensure we can keep all our participants safe while they’re in our offices, we’ve made two strides—in addition to installing an AED in our lobby, 20+ members of our team became certified in CPR and AED administration. During the training, our staff learned how to properly respond to life-threatening emergencies like cardiac arrest and choking. Cardiac Science, one of Design Science’s clients, generously donated the training and our new in-house AED. 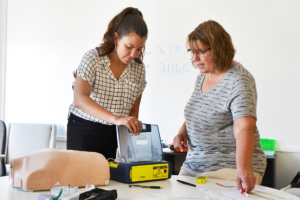 We recently supported Cardiac Science in usability studies, where we brought in potential users of their different AED models (ranging from professional first responders to people without any formal training) to evaluate how AEDs are used in real emergency situations. Christy, an associate engineer, learns how to activate the AED’s voice prompts during training. Unlike many of the products we work with, users are often unexpectedly put in the position of using an AED or performing CPR. As a member of the design team who infrequently works directly with participants, I don’t know if I’ll ever need these skills. However, I feel more confident handling an emergency because of this training. Timing is critical during these emergencies—the more prepared we are to react, the higher the chances are for survival. Over 326,000 individuals experience out-of-hospital cardiac arrest every year, according to the American Heart Association and 100,000 – 200,000 lives could be saved annually if CPR is performed early enough. We hope we’ll never have to use our new AED—but we’re sure glad our team is prepared to.